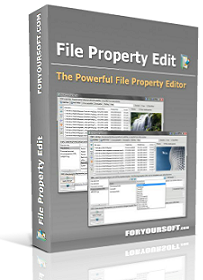 File Property Edit - Edit file properties and attributes for Free. Mac version available now! Get it from App store. 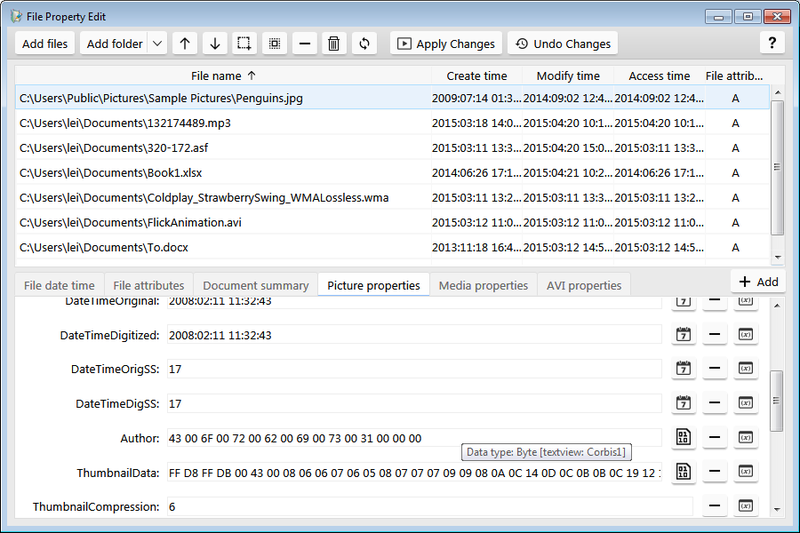 With just several clicks, you can easily change the files' attributes, including "create time", "modify time", "last access time", "read-only", "hidden", "system"... and modify their properties, such as document summary properties, photo's EXIF properties, MP3 ID3 tags (V1 and V2), and AVI RIFF Info tags. With the powerful file and folder browse feature and the drag and drop support, you can add a group of files and directories. The 1-click Undo feature allows you to rollback all the changes you just made. It also supports quick preview feature, which allows you to see the picture's thumbnail while you edit it, and the export properties feature, which allows you to export the file properties into XML file or CSV file. Reviewed as "the best among the like" on 3d2f.com. Pro version is on sale now, click here to see the details. 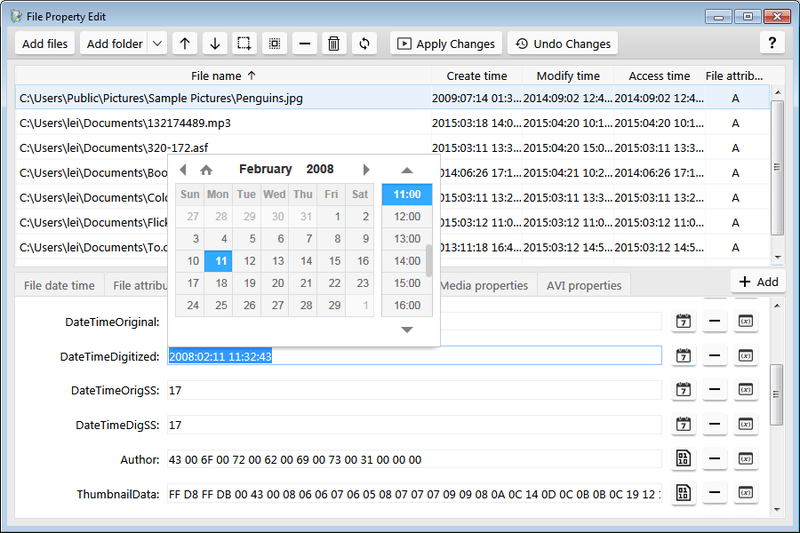 Change file and folder's "created date time", "modified date time", and "Last access date time". 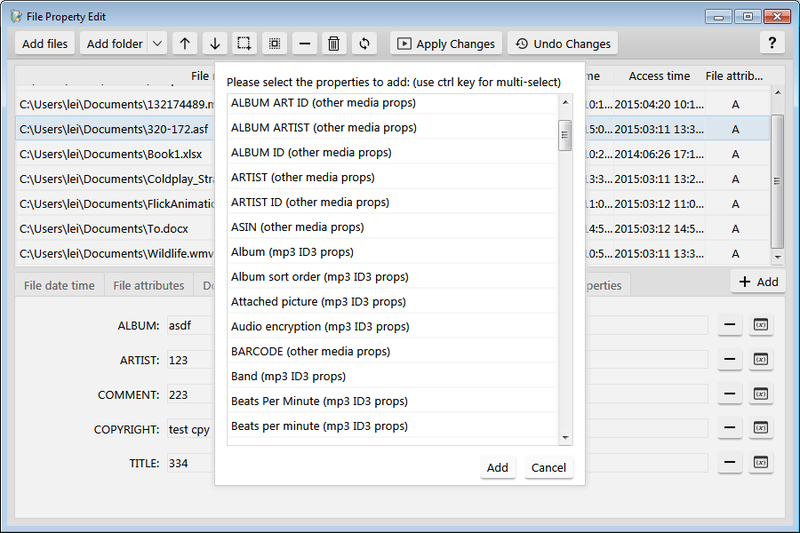 Change file and folder's attributes including "Archive", "Read Only", "Hidden", "System", "Temporary", "Offline", "Content index", or "Normal". Drag and Drop support: It's easy to add files to the list, just drag files from anywhere and drop them to File Property Edit's list. Support modify MP3 ID3 Tags including V1 and V2. Support modify all types of photo's properties including EXIF. 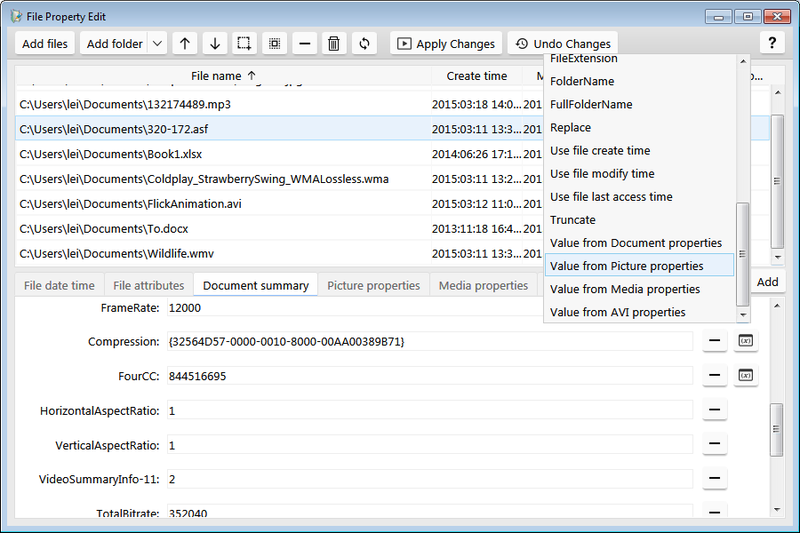 Edit the file's summary properties including: "Title", "Subject", "Author", "Keywords", "Comments", "Template", "Last Author", "Revision Number", and "App Name". QuickView feature added - support thumbnail preview of photo. Support view shell details info in QuickView. Files filter support case sensitive and exclusive filtering, with this, you can easily filter in or out the files you want from the file list. 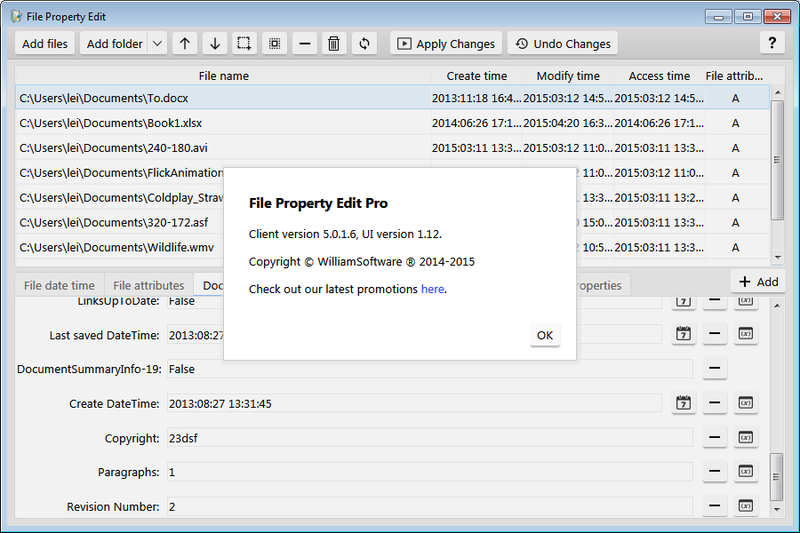 Undo changes: After you change the properties of files and folders, you can use this feature to cancel the changes, and rollback to the old property values. Support file's "Send to" menu, you can right click on files and select "Send to" File Property Edit, and then edit the properties of the selected files. Support modify file properties on Windows 8, Windows 7, for both 32 bit and 64 bit system. Support replace or remove part of the content in file properties. 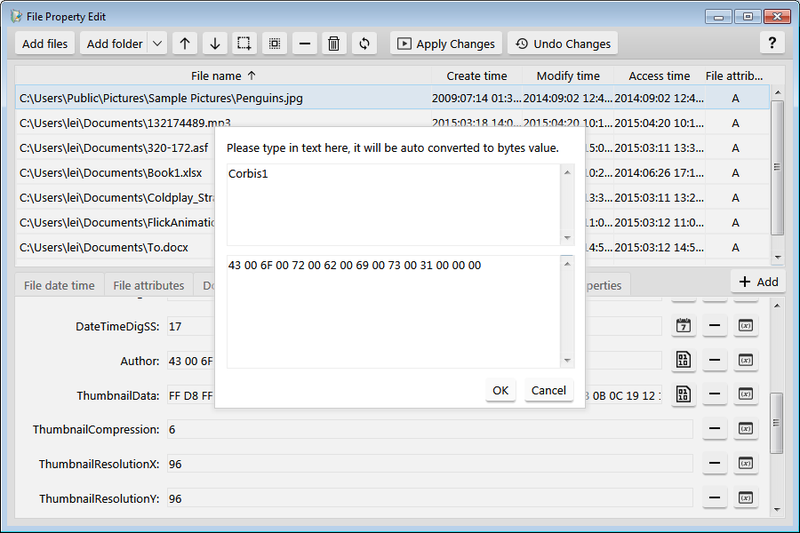 Support use variables to change file and folder's date time attributes. Support use variables to change file properties, e.g. add current date time, number series, datetime series, and use variables to increase or decrease the property value in number or datetime fields. Support use file's name or folder name as variable to change file properties. Support export properties feature, you can export file properties into XML or CSV file. 3 year free email technical support. 3 year free update to latest version and free activation service.